Creatinine, sodium citrate hydrous, sodium metabisulphite, methyl paraben, propyl paraben, sodium hydroxide, water for injection. Primary or secondary adrenocortical insufficiency; (hydrocortisone or cortisone is the drug of choice; synthetic analogs may be used in conjunction with mineralocorticoids where applicable; in infancy, mineralocorticoid supplementation is of particular importance). Acute adrenocortical insufficiency; (hydrocortisone or cortisone is the drug of choice; mineralocorticoid supplementation may be necessary, particularly when synthetic analogs are used). Severe erythema multiforme. (Stevens-Johnson Syndrome). Idiopathic thrombocytopenic purpura in adults (IV only; IM administration is contraindicated). 13. Diagnostic testing of adrenocortical hyperfunction. 14. Cerebral Edema associated with primary or metastatic brain tumor, craniotomy, or head injury. as neurosurgery or other specific therapy. May also be useful in cystic tumors of an aponeurosis or tendon (ganglia). EPIDRON 4 mg/mL is for intravenous, intramuscular, intra-articular, intralesional and soft tissue injection. EPIDRON can be given directly from the vial, or it can be added to sodium chloride injection or dextrose injection and administered by intravenous drip. Solutions used for intravenous administration or further dilution of this product should be preservative-free when used in the neonate, especially the premature infant. When it is mixed with an infusion solution, sterile precautions should be observed. Since infusion solutions generally do not contain preservatives, mixtures should be used within 24 hours. 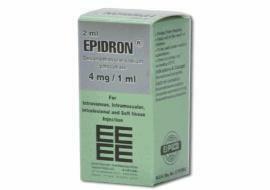 The initial dosage of EPIDRON varies from 0.5 to 9 mg a day depending on the disease being treated. In less severe diseases, doses lower than 0.5 mg may suffice, while in severe diseases doses higher than 9 mg may be required. The initial dosage should be maintained or adjusted until the patient's response is satisfactory. If a satisfactory clinical response does not occur after a reasonable period of time, discontinue EPIDRON and transfer the patient to other therapy. Patients should be observed closely for signs that might require dosage adjustment, including changes in clinical status resulting from remissions or exacerbations of the disease, individual drug responsiveness, and the effect of stress (e.g. surgery, infection, trauma). During stress it may be necessary to increase dosage temporarily. When the intravenous route of administration is used, dosage usually should be the same as the oral dosage. In certain overwhelming, acute, life-threatening situations, however, administration in dosages exceeding the usual dosages may be justified and may be in multiples of the oral dosages. The slower rate of absorption by intramuscular administration should be recognized. Cavanagh: 3 mg/kg of body weight per 24 hours by constant intravenous infusion after an initial intravenous injection of 20 mg.
Dietzman: 2 to 6 mg/kg of body weight as a single intravenous injection. Frank: 40 mg initially followed by repeat intravenous injection every 4 to 6 hours while shock persists. Oaks: 40 mg initially followed by repeat intravenous injection every 2 to 6 hours while shock persists. Schumer: 1 mg/kg of body weight as a single intravenous injection. Although adverse reactions associated with high dose, short-term corticosteroid therapy are uncommon, peptic ulceration may occur. Administration of high dose corticosteroid therapy should be continued only until the patient's condition has stabilized and usually not longer than 48 to 72 hours. EPIDRON is generally administered initially in a dosage of 10 mg intravenously followed by 4 mg every 6 hours intramuscularly until the symptoms of cerebral edema subside. Response is usually noted within 12 to 24 hours and dosage may be reduced after 2 to 4 days and gradually discontinued over a period of 5 to 7 days. For palliative management of patients with recurrent or inoperable brain tumors, maintenance therapy with 2 mg 2 or 3 times a day may be effective. EPIDRON injection 4 mg/mL; first day, 1 or 2 mL (4 or 8 mg), intramuscularly followed by oral therapy. Intra-articular, intralesional and soft tissue injections are generally employed when affected joints or areas are limited to one or two sites. he usual dose is from 0.2 to 6 mg. The frequency usually ranges from once every 3 to 5 days to once every 2 to 3 weeks. EPIDRON is particularly recommended for use in conjunction with one of the less soluble, longer-acting steroids for intra-articular and soft tissue injection. Hypersensitivity to any component of this product, including sulfites. Serious neurologic events, some resulting in death, have been reported with epidural injection of corticosteroids. Specific events reported include, but are not limited to, spinal cord infarction, paraplegia, quadriplegia, cortical blindness, and stroke. These serious neurologic events have been reported with and without use of fluoroscopy. The safety and effectiveness of epidural administration of corticosteroids has not been established, and corticosteroids are not approved for this use. Because rare instances of anaphylactoid reactions have occurred in patients receiving parenteral corticosteroid therapy, appropriate precautionary measures should be taken prior to administration, especially when the patient has a history of allergy to any drug. Anaphylactoid and hypersensitivity reactions have been reported for dexamethasone sodium phosphate injection. EPIDRON contains sodium metabisulfite, a sulfite that may cause allergic-type reactions including anaphylactic symptoms and life-threatening or less severe asthmatic episodes in certain susceptible people. The overall prevalence of sulfite sensitivity in the general population is unknown and probably low. Sulfite sensitivity is seen more frequently in asthmatic than in non-asthmatic people. Corticosteroids may exacerbate systemic fungal infections and, therefore, should not be used in the presence of such infections unless they are needed to control drug reactions due to amphotericin B. Moreover, there have been cases reported in which concomitant use of amphotericin B and hydrocortisone was followed by cardiac enlargement and congestive failure. In patients on corticosteroid therapy subjected to any unusual stress, increased dosage of rapidly-acting corticosteroids before, during, and after the stressful situation is indicated. Corticosteroids may mask some signs of infection, and new infections may appear during their use. There may be decreased resistance and inability to localize infection when corticosteroids are used. Moreover, corticosteroids may affect the nitroblue-tetrazolium test for bacterial infection and produce false negative results. Persons who are on drugs which suppress the immune system are more susceptible to infections than healthy individuals. Chickenpox and measles, for example, can have a more serious or even fatal course in non-immune children or adults on corticosteroids. In such children or adults who have not had these diseases, particular care should be taken to avoid exposure. How the dose, route and duration of corticosteroid administration affects the risk of developing a disseminated infection is not known. The contribution of the underlying disease and/or prior corticosteroid treatment to the risk is also not known. If exposed to chickenpox, prophylaxis with varicella zoster immune globulin (VZIG) may be indicated. If exposed to measles, prophylaxis with pooled intramuscular immunoglobulin (IG) may be indicated. (See the respective package inserts for complete VZIG and IG prescribing information). If chickenpox develops, treatment with antiviral agents may be considered. The use of EPIDRON in active tuberculosis should be restricted to those cases of fulminating or disseminated tuberculosis in which the corticosteroid is used for the management of the disease in conjunction with appropriate antituberculous regimen. Aspirin should be used with caution in conjunction with corticosteroids in hypoprothrombinemia. False negative results in the dexamethasone suppression test (DST) in patients being treated with indomethacin have been reported. Thus, results of the DST should be interpreted with caution in these patients. A marked increase in pain accompanied by local swelling, further restriction of joint motion, fever, and malaise is suggestive of septic arthritis. If this complication occurs and the diagnosis of sepsis is confirmed, appropriate antimicrobial therapy should be instituted. The slower rate of absorption by intramuscular administration should be recognized. EPIDRON contains sodium metabisulphite, a sulfite that may cause allergic-type reactions including anaphylactic symptoms and life-threatening or less severe asthmatic episodes in certain susceptible people. Sulfite sensitivity is seen more frequently in asthmatic than nonasthmatic people. Susceptible patients who are on immunosuppressant doses of corticosteroids should be warned to avoid exposure to chickenpox or measles. Patients should also be advised that if they are exposed, medical advice should be sought without delay. Muscle weakness. steroid myopathy, loss of muscle mass, osteoporosis, vertebral compression fractures, aseptic necrosis of femoral and humeral heads, tendon rupture, pathologic fracture of long bones. Peptic ulcer with possible subsequent perforation and hemorrhage, perforation of the small and large bowel; particularly in patients with inflammatory bowel disease, pancreatitis, abdominal distention, ulcerative esophagitis. Impaired wound healing, thin fragile skin, petechiae and ecchymoses, erythema, increased sweating. Burning or tingling especially in the perineal area (after IV injection) other cutaneous reactions, such as allergic dermatitis, urticaria, angioneurotic edema. Convulsions, Increased intracranial pressure with papilledema (pseudotumor cerebri) usually after treatment, vertigo, headache, psychic disturbances. Menstrual irregularities, development of cushingoid state, suppression of growth in children. Secondary adrenocortical and pituitary unresponsiveness, particularly in times of stress, as in trauma, surgery, or illness. Posterior subcapsular cataracts, increased intraocular pressure, glaucoma, exophthalmos. Myocardial rupture following recent myocardial infarction. Anaphylactoid or hypersensitivity reactions, thromboembolism, weight gain, increased appetite, nausea, malaise, hiccups. Post-injection flare (following intra-articular use). Dexamethasone sodium phosphate injection has a rapid onset but short duration of action when compared with less soluble preparations. Because of this, it is suitable for the treatment of acute disorders responsive to adrenocortical steroid therapy. Naturally-occurring glucocorticoids (hydrocortisone and cortisone), which also have salt-retaining properties, are used as replacement therapy in adrenocortical deficiency states. Their synthetic analogs, including dexamethasone, are primarily used for their potent anti-inflammatory effects in disorders of many organ systems. At equipotent anti-inflammatory doses, dexamethasone almost completely lacks the sodium-retaining property of hydrocortisone and closely-related derivatives of hydrocortisone. Carton box glass of 2 ml solution.